Conventional wisdom says the modern wristwatch was born on the trenches of Europe. The pocket watches that were the norm for turn of the century gentlemen were not terrifically practical on the field of battle. The soldiers welded wire lugs to the cases and secured them to leather straps and cuffs. The practice may have originated as early as the late 1800s (check out these amazing photographs), but it certainly gained wide acceptance during World War One. 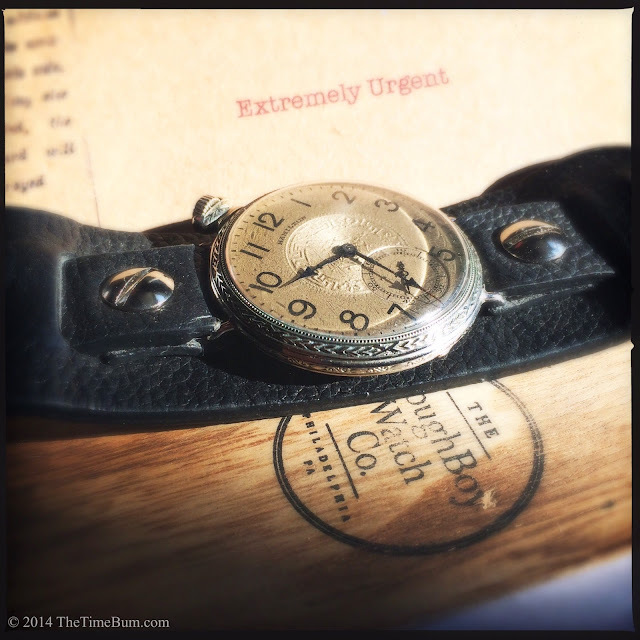 These trench watches are rare today, but The DoughBoy Watch Company of Philadelphia, Pennsylvania can give you one just like your great (or great-great) grandfather might have worn. They source vintage pocket watches, refurbish them, add wire lugs, and fit them to custom made leather straps with pass-through cuffs. For this review, they sent a "Top Gun" 1936 Hamilton. My readers know that The Time Bum is not generally impressed with packaging. No matter how nice your watch box may be, I can't wear the box. Still, every so often, a watch company gets it right, and creates packaging that actually enhances the experience of buying the watch. DoughBoy has done this with a weathered little wooden box with a sliding lid. Inside, your trench watch is cushioned in a bed of shredded currency. Accompanying the box is a brown envelope with a wax seal. 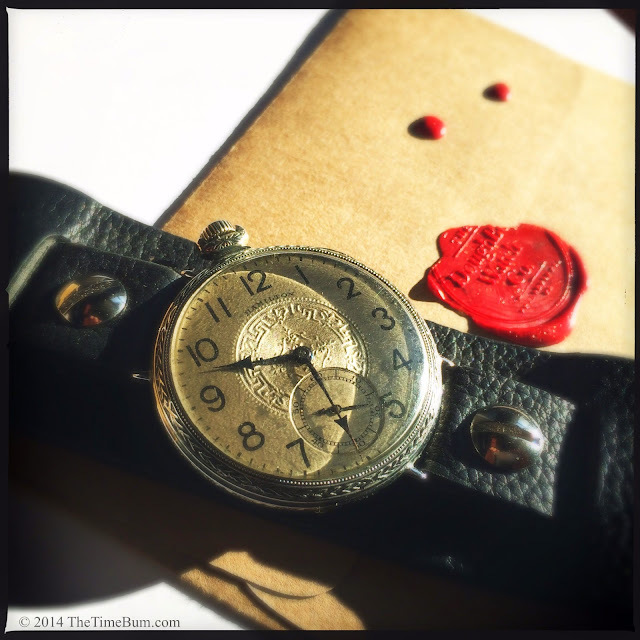 It looks like a missive from the front lines of the Somme, but it contains a personalized note describing your watch and explaining its functions. It is clever, deceptively simple, and fun. I appreciate that DoughBoy cleans up the watches without over restoring them. The Hamilton is remarkably well preserved but undoubtably antique with just enough patina to remind you of its 78 year life. It wears its age in a respectable fashion, unmolested by embarrassing face lifts. Needless to say, every watch will be different, but this one gives a nice taste of what they offer. The metal dial is a lovely pale gold with some light mottling around the edges. The printed numbers and indicies look remarkably good, showing a bit of weathering, but no significant flaking or deterioration, even on the fine printing of the small seconds sub dial. There is a marvelous embossing in the center and the hands are blued - not painted blue, but blued by heat to create a lustrous midnight color. 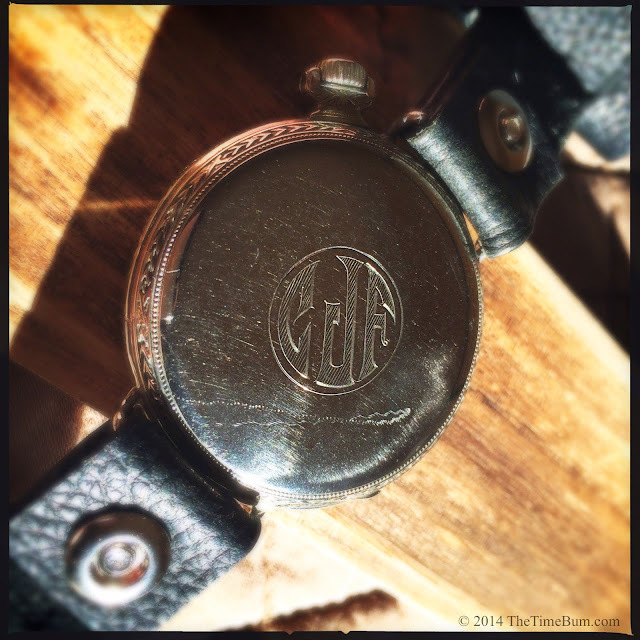 This watch is a size 12s, which likely means nothing to you unless you are versed in the world of pocket watches. Unlike modern wrist watches, case sizes for pocket watches were not standardized, so the size refers to the diameter of the movement and is best considered to be a ballpark figure. This is one of the smaller ones, measuring just under 39.79mm. Taking my calipers to the Hamilton, I measured a 40mm dial inside a 44mm case. It is 11mm thick from case back to crystal. It is a large watch, but not excessively so, and it wears its diameter with more grace than many modern counterparts. There is wonderful detail in this original, 14 Karat case, from the beading surrounding the dial, to the wreath encircling the edge, to the original owner's monogram on the case back. The lugs are a sympathetic addition, welded in place without destroying the original work beneath. They are fixed at the upper right and lower left quadrants of the case so it sits in the canted "drivers watch" position. 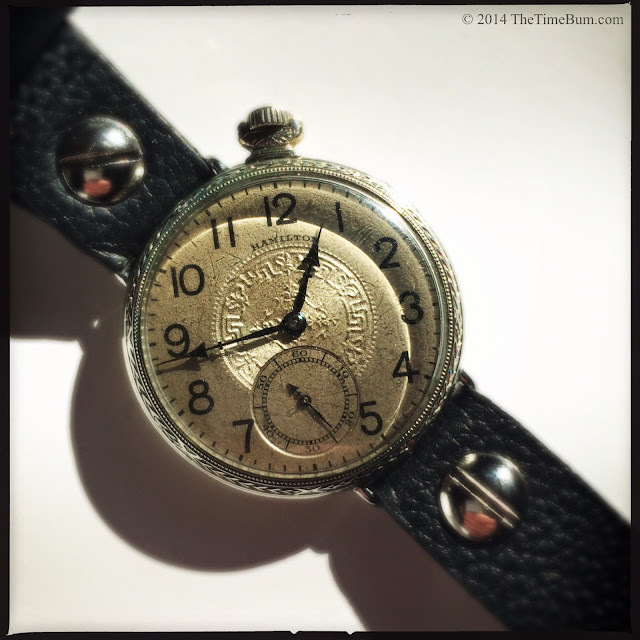 Wearing the DoughBoy was no problem, but one must remember that this is not a modern watch. Water resistance is non existent. This watch is topped with domed acrylic but many earlier pieces will have good old fashioned crack-and-shatter-prone glass. The movement is a 17 jewel hand winder. It has a pleasant mechanical tick if you listen closely, but nothing as loud as a Timex Weekender. You can't expect split second accuracy from an old mechanical movement, but I noted the time when it took it off at the end of the day, and found that it was less than one minute slow. I'd call that more than adequate. The sample cuff had already seen some use before I got it and was fully broken in. (Purchasers will recieve brand new ones, of course.) The leather is thick but very soft and pliable enough to squeeze a 20mm strap into 18mm lugs. The strap is secured with screws like that of a classic pilot's watch. A flap of leather sewn under the buckle prevents it from contacting your skin. The strap is threaded through slots in the cuff and could easily be worn without it, but the large screw heads still compete for your attention. I have to confess that as much I loved the look of the cuff, it was perhaps a bit much for my balding, bespectacled, middle-aged self. But let me tell you, back in the day, I would have totally rocked this thing. 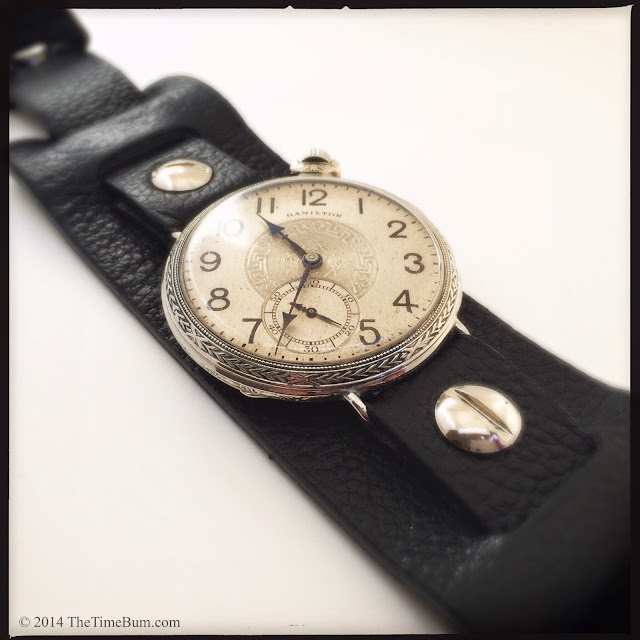 It was interesting to consider strap options for the trench watch. After all, how and where do you wear it? Despite its military origins, a converted pocket watch is hardly a suitable tool watch. On the cuff, it is strictly jeans-and-tee-shirt casual, yet the delicate gingerbread on the case and dial speak of more genteel pursuits. The fixed lugs also limit your options to one-piece pass-throughs, or open ended straps with rivets or tabs. I think of the watch were mine, I would have a simple one-piece made from Horween Shell Cordovan for a slightly more conventional look, and keep the screwed black cuff on hand when I wanted to fly my freak flag. No matter your choice, a DoughBoy conversion is going to attract a ton of attention of the reverent, admiring sort. DoughBoy has a nice selection of watches available. They are as old as the late 1800s and as new as the 1940s. Sizes are generally in modern watch range but can top 50mm on some models. They are mostly American brands like Hamilton, Waltham, Elgin, and Illinois, but there are some Jager LeCoultre, Omega, and Rolex in there too. 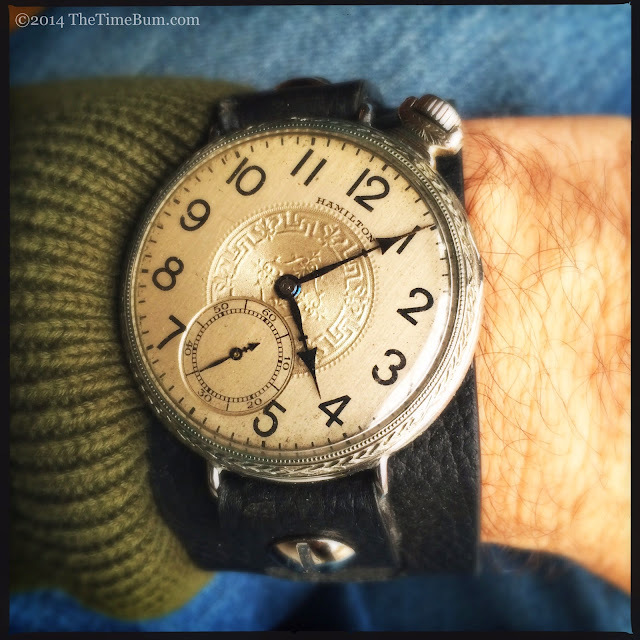 The Hamilton "Top Gun" I reviewed is listed for $750, but others go from $550 to $5500, depending on the model. Each watch is unique, and all have been serviced and carry a one year warranty. Every watch nerd should have a vintage pocket watch, if for no other reason than out of respect for our horological elders. 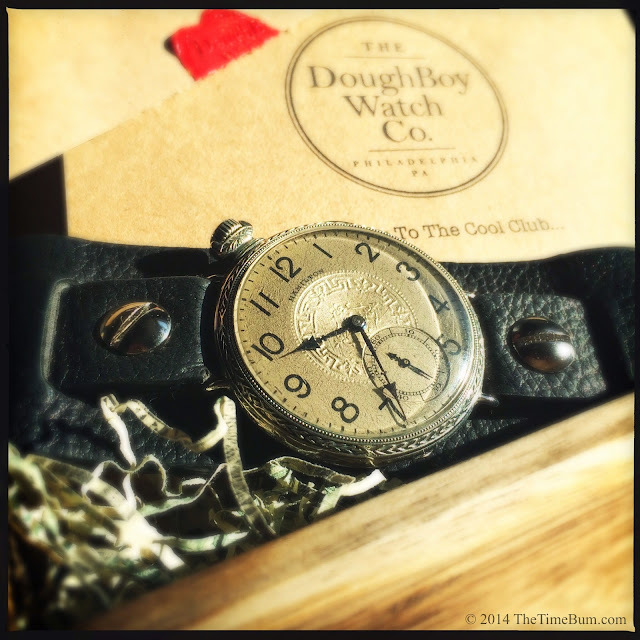 The DoughBoy conversions allow you to fill that hole in your collection, and also to use the watch in a manner that is both practical and period-appropriate. 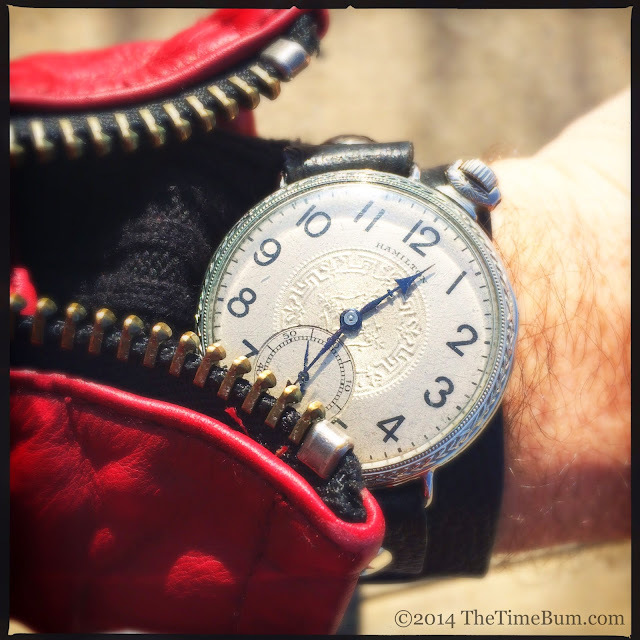 I thoroughly enjoyed my time with the Hamilton, and can easily see a trench watch in my future. Sum: A new start for a grand old gent. The Time Bum highly approves.